Identify and recognize the energy rating and certification process of window and fenestration systems as defined by national standards and codes suitable for all buildings, including green building design and renovation. Assess and compare the energy performance and other attributes of different glazing materials suitable for green buildings, renovations, and other designs. Investigate the significance of fenestration components, including frame materials and the spacers between insulating glass units related to optimizing energy performance in green buildings. Renovating existing buildings is often more common than new construction projects in many locations or within many firms. Some renovations are motivated by a change in use or in occupancy requiring new layouts, new materials, and/or new building systems. Others are initiated in response to a maintenance assessment that determines the time has come to repair or replace particular components or systems in a building. Still, others may be a simple desire to update the building whether for public appearance and marketability or for improved energy efficiency and performance. Whatever the reason, building fenestration often becomes a key part of the renovation process since it usually plays a very important role in all of these areas of use, performance, and value of a building. Making design decisions about what fenestration to use in a renovation project involves an understanding of the factors related to performance as well as knowledge of the available choices and options. It also recognizes that the final choice may be based as much on the conditions of the existing building as on the available fenestration technology. Existing buildings of all types often require new or updated fenestration to add daylight, improve energy efficiency, or add to the appeal of the building. When thinking about fenestration, it is easy to be lured into thinking only about glass and glazing. Certainly, the performance factors of heat loss or solar heat gain in glass are important as well as visible light transmittance for daylighting purposes. But while these are truly important aspects of most fenestration systems, they are not the only things that affect overall performance. The frame supporting the glazing is also a critical component whether in a fixed window unit, a curtain wall system, or a storefront system. Since the frames are often a significant portion of a fenestration product, such frames have direct impacts on thermal performance in regard to energy efficiency, and human comfort. This is particularly evident in frames that do not adequately address heat transfer, but also when they fail to restrict air leakage or condensation on the unit. Looking closer, it has been demonstrated that even the spacers used in double- or triple-paned insulating glass units can make a notable difference in the overall thermal performance of any fenestration product. In light of all this, it is important then to consider the performance of any fenestration product in its totality, not just on a single component. Together, these individual rating procedures are simply known as the NFRC Rating System, which employs both computer simulation and physical testing by NFRC-accredited laboratories. The NFRC Rating System is supplemented by two separate product certification programs, one for residential products and one for commercial (nonresidential) products, where fenestration manufacturers or responsible parties may certify and label fenestration products to indicate the performance ratings achieved. Both of these product certification programs are current as of April 2014 and are generally updated on a two-year cycle. The National Fenestration Rating Council (NFRC) has developed an objective series of standards and testing procedures to rate and compare the total performance of different fenestration products. As noted, glazing is an important, albeit not the only, component in a fenestration product. When used in renovation projects, it needs to provide a number of different qualities. From a performance standpoint, presumably it will provide an improvement over existing glazing in terms of daylighting, solar heat gain, or thermal energy loss. From a design perspective, it will likely need to blend with an existing visual scheme for a building or contribute to a conscious effort to change the building appearance for the better. If the building is governed by historic preservation guidelines, there may well be restrictions on glass color, thickness, etc. that will need to be assessed and appropriate solutions found. In light of all of this, let’s take a closer look at some glazing options. Float glass: The term “float” refers to the manufacturing process in which molten glass is floated atop a pool of liquid tin in order to establish its surface flatness. Float glass is available as clear, low-iron (in which the trace green tint of clear glass is reduced) or a range of tint colors, including a fairly new series of lighter colors (light gray and light blue). Different thicknesses of float glass are available associated with the structural capacity and deflection control requirements of a broad range of fenestration needs. Annealed glass: All float glass is initially produced as annealed, meaning that the glass is gradually cooled to room temperature to relieve residual stress in the glass. Annealed glass can be readily cut, machined, drilled, edged, and polished during the fabrication process. Heat-strengthened glass: Heat-strengthened glass is produced by a heat treatment process within which the temperature of the glass is gradually elevated to more than 1,000 degrees Fahrenheit, and then the surfaces of the glass are rapidly cooled in order to develop permanent compressive stresses at the glass surfaces. When heat- treated glass is necessary to resist the thermal stresses on a project (and tempered glass is not otherwise necessary), heat-strengthened glass is often the optimal solution. Heat-strengthened glass is approximately twice as strong as annealed glass. Tempered glass: Tempered glass is heat-treated in the same manner as heat-strengthened glass, except that the quenching process is intensified in order to develop higher residual compressive stresses. Tempered glass will break into small dice-like pieces with relatively dull edges, and tempered glass qualifies as safety glazing. While tempered glass is approximately four times as strong as annealed glass, heat-strengthened glass is less likely to escape from its frame in the event of breakage. Laminated glass: Laminated glass consists of two or more plies of glass bonded with an interlayer material, most commonly polyvinyl butyral (PVB). Because the interlayer serves to retain shards in the event of glass breakage, laminated glass can constitute safety glazing. It can also provide significant acoustic performance, UV protection, and resistance to hurricane impact, blast, and forced entry. Insulating glass units (IGUs): Insulating glass units, consisting of two or more panes of glass separated by a sealed gaseous space, are widely necessary in order to meet energy codes. A low-e coating is commonly implemented on the number-two surface of the unit (the inner surface of the outermost lite of glass) in order to provide energy performance. In a renovation project, the optimal glass selection will depend upon matching the particular project requirements for performance and aesthetics with the combination of features provided by each glass type. In buildings where increased energy efficiency is sought, then low-e coated insulating glass units can be used to achieve the appropriate level of solar heat gain control as a likely starting point. Aesthetics don’t need to be compromised in this case since there are more choices in such treated glass units than ever before, including some that are very lightly colored to achieve the desired effects. If safety or security are motivating the renovation, then heat-strengthened, tempered, or laminated glass can be used in one or more lites of an IGU to achieve those requirements. There are also numerous other options available to design teams, including a range of tint colors, a palette of coatings, acid-etched glass, patterned glass, ceramic frit of many colors and configurations, colored interlayers, and digitally-printed glass. Photo courtesy of Guardian Industries Corp.
Glass has many varied properties that contribute to both performance and appearance in renovation and addition projects, such as the Chihuly Glasshouse in Seattle, Washington. In addition to glass, there are certainly other choices to consider when selecting glazing, such as acrylic or fiberglass reinforced panels. These have been popular in buildings that receive heavy use, such as industrial settings or where vandalism or other abuse needs to be warded off, and have been used in such settings for quite some time. However, there are also other glazing options worth considering. In renovation projects where vision glazing is not required, but energy efficiency and daylighting are, then translucent, multiwall, cellular polycarbonate sheets have been successfully used as a viable alternative. Multiwall polycarbonate has been commonly used in Europe for some time with growing use in the United States. It is essentially fabricated as an extrusion with two outer sheets of polycarbonate joined together by internal ribs or cellular connectors. As such, it creates a form of insulated double glazing that is available in large sizes to minimize joints—up to 54 feet in length in some cases. Tongue and groove joinery is even available to connect sheets and provide a clean appearance without the need for vertical framing. The use of cellular polycarbonate glazing has been shown to provide many benefits over other more traditional glazing materials. First of all, it is lighter in weight compared to similarly sized insulated glass units, making handling, installation, and replacement easier to address. It can also provide excellent insulating values on the order of U-0.25 (R-4) for 40-millimeter-thick panels. Polycarbonate as a material provides greater light transmission than other non-vision glazing, such as insulated fiberglass reinforced panels (FRPs). It is also dramatically stronger, demonstrating 250 times more impact resistance than an equivalent thickness of annealed glass. From a code compliance standpoint, polycarbonate is preferred over acrylic because polycarbonate is a cc-1 fire rated material, while acrylic is not. Finally, because of the nature of the product, it can be specified with 100 percent recyclable material, including any framing made from aluminum. When it comes to installing polycarbonate glazing, it is common for a manufacturer to provide a complete system with glazing, framing, gaskets, etc. that have been tested as an assembly with results available for comparison to other products. The beauty of the system is that it is easily field installed and, when necessary, can be cut on-site into custom shapes and sizes whether to meet the needs of new construction or to cleanly fit into existing openings in renovation projects. It can also be used to create large translucent walls in areas that need daylight but not vision, such as warehouses and aircraft hangars, making it very well suited for retrofitting such buildings. Polycarbonate cellular glazing is well suited for high use or industrial buildings that need energy-efficient daylight but not clear vision. Polycarbonate glazing systems don’t need to be limited to fixed installations. Manufacturers also offer operable systems that can be opened or closed, making them ideally suited to provide natural ventilation while still allowing plenty of daylight in open or closed positions. 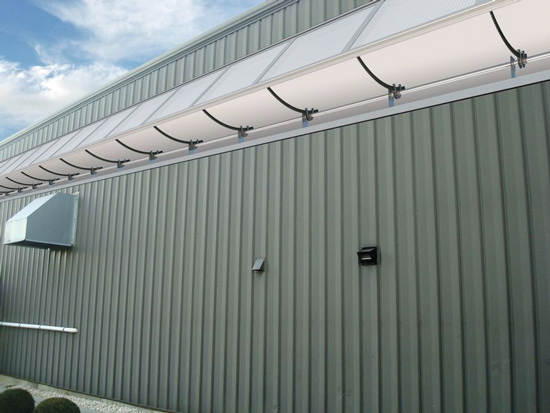 This can be an ideal solution in many utility and industrial buildings that need both natural light and fresh air. Of course, there is also still the need to protect against rainwater, so at least one manufacturer has developed an innovative solution that allows for an awning-style window arrangement that sheds water while still allowing natural ventilation. Such an operable system provides more control and more fresh air than a louvered system, and it can be applied to fairly large walls in continuous sections up to 150 feet long and 8 feet high. Consistent with energy code requirements and user needs, the operation can be undertaken manually or electrically and tied into a control system for energy, security, or other reasons. With a central operating feed connected to a line of glazing panels, the entire section can be open or closed at will. Such systems are intended for installations that have high demands so they are typically fabricated from durable and robust materials that allow smooth operation over time. The operators and thermally broken glazing can be configured to work on vertical walls or sloped surfaces to provide window or skylight type solutions. The operators obviously need to be sized to carry the weight and operate the panels, but glazing panel heights of between 3 feet and 8 feet are common. Overall, when properly designed and coordinated, the system provides a lightweight, economical, energy-efficient, and code-compliant option for non-vision glazing. Operable panels of lightweight polycarbonate glazing can provide both daylight and natural ventilation in a variety of settings. EFCO’s new 5600 PG is a versatile curtain wall system available in stock lengths, with pre-glazed capability or factory fabricated, assembled and glazed. Available outside glazed captured or SSG curtain wall system for low- to midrise buildings. Depths of 6", 7.5", and 10" are available for greater design flexibility. The LightWall® Series 3440 Interlocking Polycarbonate Wall System combines beauty, durability, and economy with panels up to 54 ft. long (vertical). Easy installation reduces field labor costs with this fully fabricated, lightweight system. Backed by EXTECH’s 40 years of engineering experience, LightWall® provides comfortable diffused daylighting without overheating. Firestone Building Products offers a SkyScape™ Pregrown Modular System as part of its SkyScape™ Vegetative Roof System Portfolio. Built on a foundation of a 100 percent recycled high-density polypropylene, the unit’s unique engineered design manages stormwater through unitized moisture retention reservoirs and encourages airflow beneath the modules. Guardian SunGuard® SNX 51/23 glass boasts an industry-leading combination of high light transmission and low solar heat gain, meeting North America’s most stringent energy codes. With low reflectivity and a neutral blue appearance, SNX 51/23 gives architects another option to build with light. The HMF line offers great aesthetics and variety. Narrow sight lines are achieved through a unique glass and sash interface, allowing for design flexibility and a modern look.